The 2019 Monaco Yacht Show will see the debut of this exciting new conversion project, which is currently at the ICON Yachts shipyard in the Netherlands. 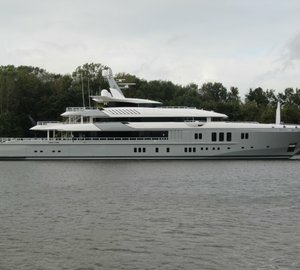 Measuring 68.20m (223′ 9”), superyacht Project Ragnar is promising to be an exceptional explorer yacht that will enter the world of luxury yacht charter once delivered in September, beginning her journey in Scandinavia. After taking the North West Passage, she will cruise Greenland, east coast of Canada and through to Alaska. Originally built in 2012 under the name SANABORG and serving as a naval ship, Ragnar is at the final stages of an extensive conversion operation and will be ICE Class A1 certified, allowing her to undertake polar explorations. She will carry an amazing selection of equipment and ‘toys’ including various land, sea and air vehicles for an ‘out-of-this-world’ charter experience. She also has a fully-certified helicopter landing pad with a refuelling facility. One of the changes that were undertaken during the conversion, was the removal of a number of tanks, with the area subsequently being converted into a huge leisure centre, that includes a fully-equipped gymnasium, a spa area with sauna, massage room, steam room, ice bowl & cold bucket, rainforest shower and a hot and cold foot spa. Exterior deck features include the ever-so-popular Jacuzzi hot tub and sunbathing possibilities. The interiors, designed by Redman Whiteley Dixon feature an unusual Medieval warship theme combined with British heritage and contemporary lines. Up to 12 charter guests can be accommodated across a seven-cabin layout, incorporating two large master suites, four doubles and one staff twin cabin. All suites have their own private ensuite bathroom facilities and luxury amenities. A crew of 13 professional and highly-skilled members will ensure everyone has the uptime charter experience on board. 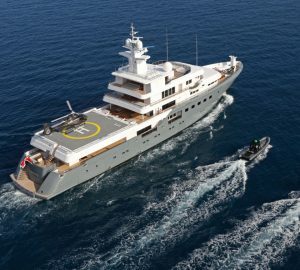 Please contact CharterWorld - the luxury yacht charter specialist - for more on superyacht news item "New to World of Luxury Yacht Charter: 68m Conversion Project Ragnar".